Risky employee behaviors permeate all layers of a company’s defense-in-depth strategy — and even the best technical tools cannot stop end users from making bad decisions. We believe end-user training should be part of your defense-in-depth strategy: An approach that couples endpoint remediation and end-user remediation will get you closer to zero risk than technical safeguards or security awareness training could on their own. 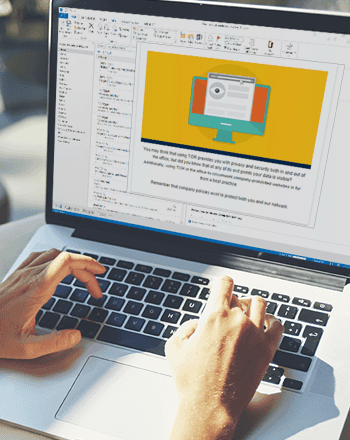 Our patented Education Triggers solution allows you to seamlessly deliver security education at the desktop, effectively marrying your endpoint and end-user remediation efforts. Our technology partnerships help maximize your return on your investment in both endpoint security and our security education. Education Triggers allows you to use existing functionality to add an important layer to a defense-in-depth strategy. It is currently available for Wombat customers who also use Carbon Black Enterprise Response, an advanced endpoint threat detection and response solution. 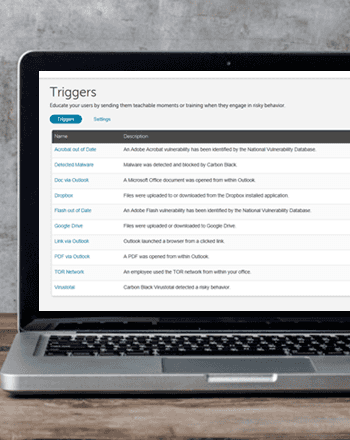 By integrating our security awareness training tools with Carbon Black’s endpoint protection solution, dangerous actions become Education Triggers. You can use this joint solution to sense risky employee actions, and then deliver just-in-time training in response to those actions, which helps to lower your overall cybersecurity risk. Our Education Triggers enable real-time intervention through immediate follow-up in the form of Teachable Moments and training. This solution allows you to automatically deliver a training assignment to a user who does something dangerous while using their work-issued PC on your network. Combine responsive and proactive training to identify and address your areas of vulnerabilities. Use your security awareness training program to improve your users’ behaviors over time, and employ Education Triggers to alert your users to risky behaviors, including visiting potentially dangerous websites, using out-of-date plug-ins, opening potentially dangerous files, and downloading malware. 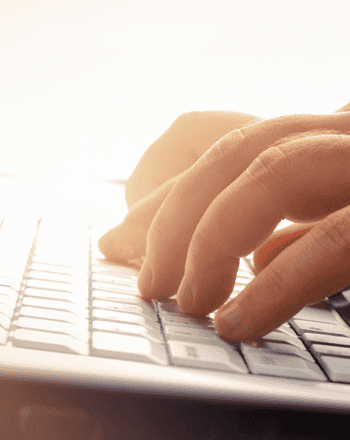 Education Triggers integrates with endpoint security software platforms that monitor end-user behaviors. When a trigger (risky behavior) is detected, the end user receives a Teachable Moment that is designed to explain the dangers associated with that particular action and prevent ongoing risky behavior. 1. A Wombat Threat Intelligence Feed has been incorporated into the Carbon Black Enterprise Response system. This feed seamlessly integrates with your current implementation of the Carbon Black software. 3. If a risky behavior is detected, we deliver a Teachable Moment email to the end user (once your threshold is met). This message alerts the user to the mistake that was made and offers advice about avoiding the behavior in the future. 4. Administrators can also assign more in-depth training to end users if they feel the need to escalate the situation (e.g., a user has made a similar mistake multiple times). 5. A business intelligence report gives you the ability to view the number of “hits” by type, over time, and whether a Wombat Teachable Moment was triggered. This information helps you to identify the types of risky behaviors that are happening on your network, as well as the employees who are taking those risks. Teachable Moments help end users understand the risk they are imposing on the organization, and help raise awareness about how to avoid the risky behavior in the future. 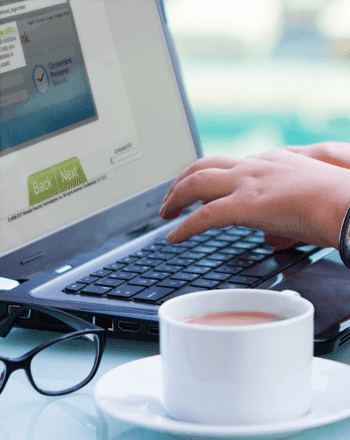 We have seen the value of this type of real-time interaction within our simulated attack products, which immediately display Teachable Moment messages when a user interacts with a phishing test. Our training statistics show the impact of in-the-moment messaging, and the willingness of users to learn how to prevent future mistakes. Our Education Triggers make this possible in real-life situations, not just as a result of simulated attacks. We selected Wombat because they offer a comprehensive cybersecurity preparedness platform. Wombat's Platform enables us to assess internal risk and target training to employees who need it most, thereby strengthening our security profile. We value the opportunity to collaborate with Wombat as the company continues to expand its suite of cybersecurity training modules.